Let's take a look at Arizona State baseball's all-time starting nine in this edition of the NCAA.com series of the best possible starting lineups for some of college baseball’s most successful programs. Here is how we picked the team: We dug deep in the record books, only considering the players' college careers. Their achievements in professional baseball did not come into play. There was also consideration given to their positional fits and how well they fit into a batting order we made based on historical stats that could provide a combination of high batting averages, speed, and power. Arizona State has a long and storied tradition, winners of five national championships and national runners-up another five times. The Sun Devils have 11 College Baseball Hall of Famers and three Golden Spikes Award winners. Several of the program’s biggest names — sluggers Reggie Jackson and Rick Monday, for example — were there for so little time it’s difficult to put them on an all-time roster. Even without those names, there are quite a few baseball icons that made the cut. McDowell was one of three Golden Spikes Award winners to hail from Tempe. That 1984 season was borderline absurd as McDowell hit .405 with 101 runs scored, 23 home runs, and 74 RBI and swiped 36 bases, the second consecutive season with 36 stolen bases. He took his award right to Los Angeles where he played on an absolutely stacked U.S. Olympic team. McDowell finished his Arizona State career with a .380 batting average (12th-best all-time) and a .644 slugging percentage which is ninth in ASU history. It wasn’t simply Pedroia’s bat that made him a legendary Sun Devil — his name is in the top 10 of quite a few offensive categories — but he was twice the national defensive player of the year. Pedroia was as valuable keeping runs off the board as he was putting them up there. He had plenty of accolades as a 2004 Golden Spikes finalist and the 2003 Pac-10 co-player of the year in finishing his career with 212 runs (T-7 all-time), 298 hits (fourth), 71 doubles (third), and 423 total bases (tenth). Bonds' storied major league career has its roots in the desert starting in 1983. Bonds not only left his mark in the Arizona State record books but the College World Series books as well, tied with Alabama’s Dave Magadan for the most consecutive hits in Omaha with eight in 1984. Bonds belted 45 home runs and hit better than .360 twice in his three years with Arizona State, securing his name in college baseball lore. Sal Bando — Most Outstanding Player of the Sun Devils' first national championship — is the starting third baseman for any other program, but there is no question Horner gets the start. 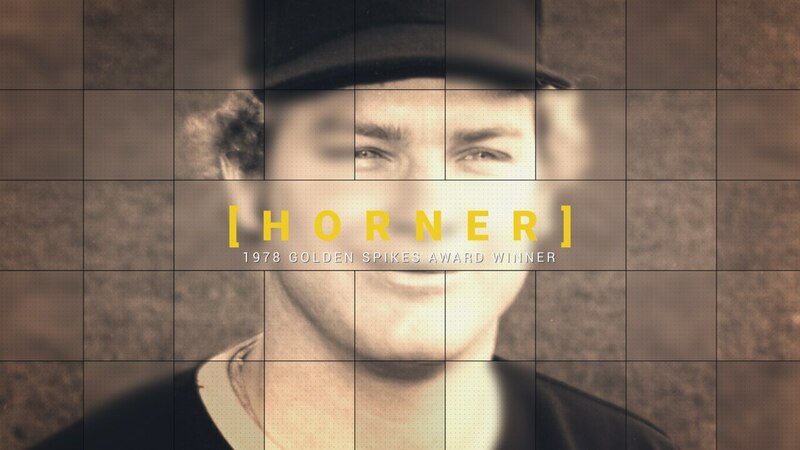 Horner wasn’t just the first Sun Devil to take home the Golden Spikes Award, he was the first-ever recipient of the now prestigious honor. Horner’s 1978 season was video game-like, hitting .412 with 25 home runs, 100 RBI and 81 runs scored and he finished his career the program’s all-time leader in home runs with 56. He was versatile, playing all over the infield, but the Golden Spikes and Most Outstanding Player of the 1977 College World Series championship slides in at the hot corner. On this date in 1978 - College Player of the Year Bob Horner from Arizona State was selected first in the draft by @Braves , and went straight to the major leagues, winning ROY with 23 HR in 89 games. Ho hum. Another Golden Spikes winning outfielder from Arizona State. There were plenty of options to go with here. Rick Monday turned one year at Tempe into a College World Series win — where he homered twice in Omaha — and the first-ever draft pick in Major League Baseball history. A young freshman football player named Reggie Jackson decided on baseball his sophomore season and hit .327 with 15 home run in a national player of the year campaign. Kevin Romine played two seasons with Arizona State and hit over .400 both years. Hubie Brooks? Arguably one of the best hitters in Arizona State history. And you can’t leave off Stan Holmes, who’s 1981 College World Series is legendary. The list is seemingly endless, but when it comes down to it Kelly is one of just 41 recipients of the Golden Spikes Award in the history of college baseball. That’s rare company right there. His 46 career home runs are in the top 5 of Arizona State lore and his 194 RBI are top 10. Kelly is plenty deserving of his spot on the all-time nine. Casey Myers was an All-American and two-time finalist for the Johnny Bench Award, but Lo Duca’s lone year in Tempe was a historic one. Both his .446 batting average and 129 hits are still single-season records, and his 37-game hit streak is second only to Roger Schmuck’s 45 games in 1971. He picked up The Sporting News national player of the year and co-Pac-10 player of the year while earning All-American honors. If you are going to leave your mark on a program in only one year, we suggest going at it as Lo Duca did. They say numbers don’t lie, and that makes a strong case for Casey Westlake (1973-76) at first. Westlake has more hits and doubles with the second most total bases than anyone else in Arizona State history. Brett Wallace is one of just two Sun Devils to hit .400 twice in his career, but he split time at the corners accomplishing that. But the one thing they don't have is a CWS ring. Davis does, and he was no slouch by any means. He hit .395 during that run to Omaha in 1981 and finished his career with a .362 batting average with his 200 career RBI still a top 10 mark. He could beat you with his eye as well as his bat, with his 87 walks in 1982 the most in program history. He earned All-American honors once before winning the Rookie of the Year Award in his 1984 MLB debut. Sogard is the Sun Devils only second baseman to earn two All-American nods, breaking out in a big sophomore campaign in 2006 and then joining the .400 club a year later in a junior campaign that saw him take home the Pac-12 defensive player of the year award. He was a solid all-around player too, scoring 74 runs, driving in 62, while adding 11 home runs and 18 stolen bases in his final season. Bannister or Eddie Bane, Bannister or Bane? You could lose sleep trying to figure out who the Friday night starter will be. Let's go through the checklist, shall we? Sporting News national player of the year? Bane won in 1973, while Bannister won in 1976. All-American honors? Bane took them home twice, as did Bannister. College Baseball Hall of Fame inductees? Yup, both are there, too, getting inducted in the same season. We chose Bannister to start the weekend off because of his insane 1976 season when he tied the program record with 19 wins on 17 complete games, including four shutouts, with a 1.45 ERA, still the best during the aluminum bat era. Bannister, like Bane, was a strikeout machine, striking out 217 in 1975 and 213 in that 1976 season. Bane has the lone perfect game in program history as well as the most strikeouts, and you really can't go wrong. The weekend rotation of Bannister, Bane, and Craig Swan — the program's all-time leader in wins with the third-most strikeouts — is one of the deepest you'll find in any program. This came down to Bobby Winkles and Brock, but Brock runs away with it. Winkle won one more national championship, but Brock’s overall career numbers are insane. He totaled 1,100 wins, two national championships, 11 conference titles and 13 trips to Omaha. The multi-time winner of several coach-of-the-year awards, Brock is one of college baseball’s all-time greats.